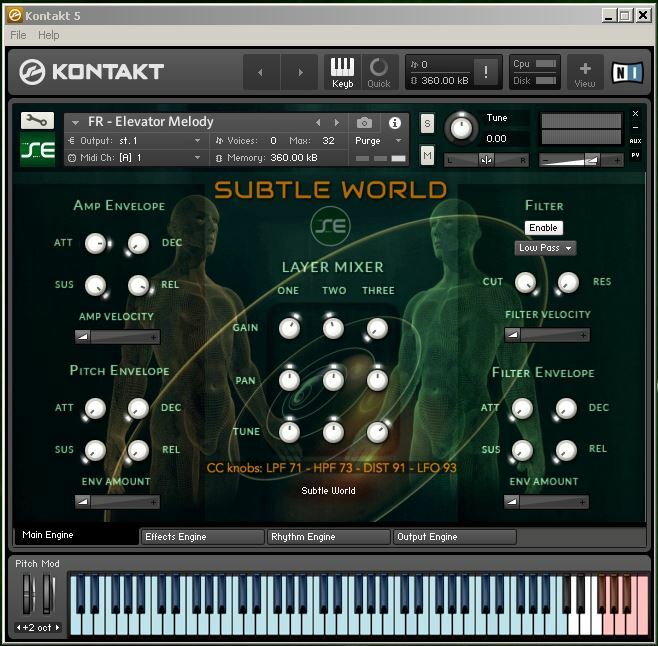 Subtle World, pulsing fields and textures for Kontakt 5, will make you delve deep into the world of Field Recordings, Textures, Pads, Rhythmic Elements, Noises, Loops and Pulsing Instruments. Aimed at Film & Game, Underscores, Ambient, IDM, Chillout, Techno, Dub, Sound Design and more. To speed up the production flow, and for your pleasure and fun, you will enjoy the pre-assigned automations features, which make very easy to "morph on the fly" all sounds. You can mutate each patch from tiny high crackles to big distorted pulsing drones. You don't need to take your hands off your MIDI keyboard to endlessly perform mutations, just use the Mod Wheel and the pre-assigned four knobs with Low Pass and High Pass filters, Distortion and custom LFOs. All FXs are in sync with your host tempo (bpm). All sounds in Subtle World are ever-evolving (long samples, hold them) and trasforming instantly with the pre-assigned MIDI controls (you MUST explore them, to fully enjoy Subtle World). NOTE: it might happen, in rare cases, that you must "batch re-save" the entire folder. It's easy: just go to Menu file and select the option, locate the Subtle World entire folder on your drive of choice and click "ok". If requested, locate the folder again. You're done.